Your cat feels happiest at home, sweet home. But when it's time for a trip to the vet or somewhere else, you know the fun that entails — getting kitty into a cat carrier. What's the trick to getting a cat into a carrier? To keep the fur from flying, avoid these common mistakes. 1. Buying the wrong carrier. Fabric carriers look cozy, but it can be hard to get a scared cat out of one safely, says Ilona Rodan, DVM, who is certified in feline practice by the American Board of Veterinary Practitioners. Instead, use a hard plastic carrier that can be taken apart at the middle so kitty can sit in the bottom half during the vet exam, Rodan says. “That’s a cat’s favorite place in the hospital because it’s most familiar,” she says. It’s best to get a carrier that also has a large opening on top, which makes it easier to put in a cat that hasn’t been trained to go in the carrier, she says. 3. Trying too hard. While you’re acclimating your cat to the carrier, don’t coax him to go in, Rodan says. “When you do that, cats get suspicious,” she says. Putting catnip and toys in the carrier can help, according to a guide on how to get your cat to the veterinarian from The American Association of Feline Practitioners (AAFP). With patience and time, your cat should come around. “Cats love to get into boxes, so why not the carrier?” Rodan says. 4. Chasing your cat around the house. Don’t wait until five minutes before you have to leave, then start pursuing kitty. That can agitate your cat and make you more likely to get bitten or scratched. Instead, if your cat is carrier trained, withhold food for a few hours, then toss a few pieces of kibble into the carrier. “Your cat should walk right in,” Rodan says. Otherwise, calmly walk into the room where the cat is sitting, close the doors, pick up the cat and put him in the carrier, she says. 5. Grabbing your cat by the scruff. Never grab your cat by the scruff of the neck to put her in the carrier. “That’s a good way to get bitten or scratched,” Rodan says. Getting grabby can frighten any feline and also cause pain for a cat with arthritis in the neck or back, she says. 6. Shoving or dropping kitty into the carrier. Don’t push your cat headfirst into a carrier, or try to back him in. Also, don’t place the carrier on its end and drop him in. “Cats don’t like any of that and will try to scratch or bite their way out,” Rodan says. Instead, if you're desperate, toss a blanket over your cat, wrap him like a burrito — being careful not to pull the blanket too tight — and slide him into the carrier, Rodan says. “It’s like swaddling a baby." 7. Forgetting to line the bottom of the carrier. Don’t put your kitty in a hard carrier without a soft place to sit. 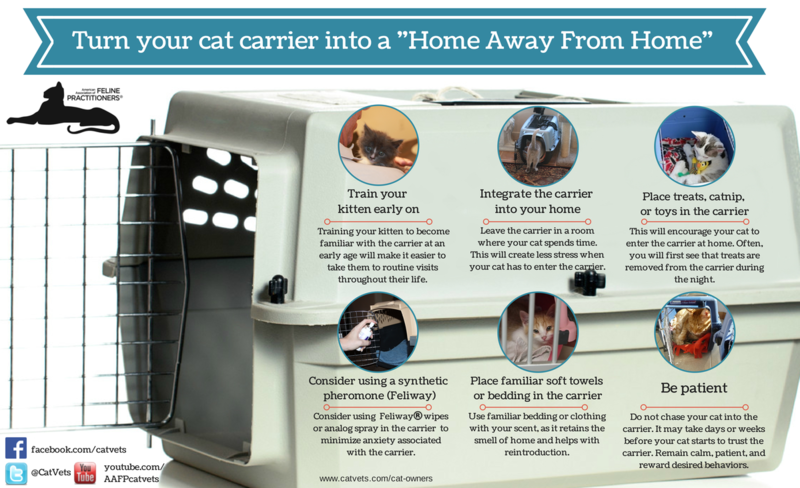 The AAFP recommends placing a blanket in the bottom of the carrier and wiping it with Feliway, a synthetic feline pheromone analog. That helps cats feel more secure, Rodan says. “It makes the carrier a not-so-scary environment,” she adds.